Fertilizer Evolved, the N-Ext Generation of fertility is here. Introducing CARBON-X™, a game changer. 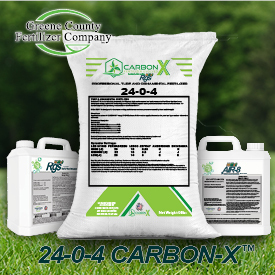 Utilizing carbon components for nutrient utilization, holding capacity, and greater buffering throughout a variety of soil types, CARBON-X™ takes fertilizer to the N-Ext level. The power of 10 components including N-Ext RGS™, an industry game changer on its own, allows for turf professionals to see dramatic changes in the health and vigor of their manicured lawns while being a steward of the soil. Now is the time to move your fert game forward. Welcome to the N-Ext™ Level of turf care. More information about the CARBON-X™ Turf & Ornamental Fertilizer improved with N-Ext RGS™ is available at greenecountyfert.com.